A new study published in the journal Appetite suggests that fast food advertising on TV programming and commercials may influence adolescents to underestimate the negative health consequences of fast food consumption. Public health officials are concerned with today’s youth consuming excessive amounts of fast food; given that there have been strong links between its consumption and prevalence of obesity and type 2 diabetes. It is believed that decreased physical activity and increased sedentary activities such as watching TV may be the reason that almost 17% of American children and youth are obese. Since American youth are spending an average of 18 hours per week in front of the TV, the increased exposure may be influencing their beliefs over whether or not there are real health risks when it comes to consuming fast food. Almost 90% of food advertising geared toward youth are products that are high in calories, sugar, fat, and sodium. More so, 23% of food products and restaurants that are advertised to this population are for fast food joints. Fast food ads are twenty times more likely to appear during prime time TV hours compared to family meals. The most concerning factor is that such advertisements, as well as TV programming, associate fast food and high calorie food choices with positive outcomes such as feeling good, helping others, togetherness, enjoyment, and a sense of accomplishment, like winning a prize. Furthermore, the characters consuming these foods are generally slim and attractive, contradictory to their lifestyle choices. Researchers from the American University conducted two online surveys to determine whether and to what extent TV exposure influenced adolescents’ fast food beliefs, specifically regarding their beliefs towards health risks of consuming fast food. The first online survey included 445 individuals, mainly ninth and tenth graders from a range of socioeconomic backgrounds. The second survey included a similar population of 1,048 adolescents. After receiving parental consent, all participants completed a personality and lifestyle survey through a secure website. The survey included questions regarding how many hours per week participants viewed TV, as well as inquired about eight different categories of TV shows such as comedies, sitcoms, reality shows, etc. The adolescents were asked how many days they had eaten at a fast food joint in the previous 30 days. They were then asked the likelihood of experiencing negative health consequences or positive outcomes of feeling good when eating at fast food restaurants every day. Study findings revealed that increased TV exposure was associated with influencing a positive perception of fast food consumption. Further, the first survey demonstrated that the more adolescents watched TV, the less likely they perceived negative health consequences with consuming fast food. Overall, the more TV that they were watching, the less likely they associated any health risks with consuming fast food. The first study also revealed that although youth are spending quite a bit of time watching TV, it in no way impacted their physical activity levels. In fact, it showed that increased TV exposure was associated with increased physical activity. Clearly, this study demonstrates the negative consequences of excessive TV exposure. 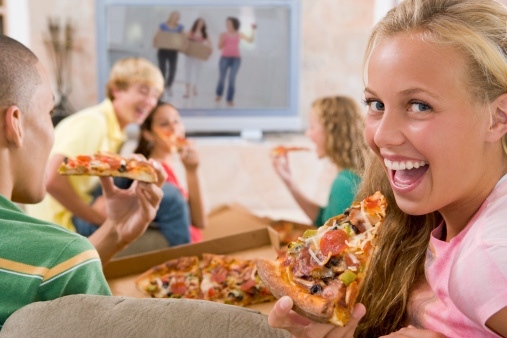 Too much TV can negatively impact a youth’s perception of health consequences of fast food intake and therefore may indirectly be a contributing factor to the increasing obesity epidemic. Russell, C.A., “The role of television viewing and direct experience in predicting adolescents’ beliefs about the health risks of fast-food consumption,” Appetite, 2015; 92: 200 doi: 10.1016/j.appet.2015.05.023.